Gangster movies come in vivid spurts, like machine-gun fire. In the early '30s, hard guys like James Cagney, Paul Muni and Edward G. Robinson paraded the sick dazzle of Prohibition-era thugs. Forty years later, the Corleones ruled, but on the margins was the subgenre of black gangster films: Superfly, Black Caesar and their bloody kin. Beneath the violent fantasies of these films was a historical fact: black mobsters were seizing power from the Italians who had run the underworld. 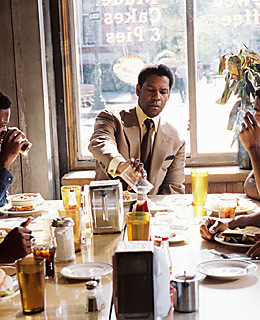 American Gangster, due out Nov. 2, is the real-life microcosm of that story. Frank Lucas (Denzel Washington) was a Harlem drug lord who, in the Vietnam era, revolutionized the heroin trade by importing the nasty white stuff directly from Southeast Asia, often in the caskets of U.S. soldiers. As Lucas amassed a $50 million fortune, he was pursued by investigator Richie Roberts (Russell Crowe). Their story was told in a 2000 New York magazine article that is the source for this film.